L-R: Director, e-Waste, Lagos State Environmental Protection Agency (LASEPA), Mr Kayode Bello, Chief Executive Officer, e-Terra Technologies Limited, Mr Ifeanyi Ochonogor, Lagos State Commissioner for Environment, Mr Babatunde Durosimi; General Manager LASEPA, Mr Antonie Ayodele and Managing Director, Harrowditch Environmental and Management Services Limited, Mr Kolawole Falase, at the 2018 e-Terra, e-Waste Recycling Exposition in Lagos, recently. The Rivers State Government has been advised to put measures in place towards preventing people from getting access to the tyre dump at the Mile I flyover park. 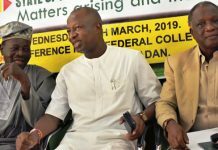 The former National President of the Nigerian Environmental Society (NES), Mr. Olu Ander Wai-Ogosu who said this in an exclusive interview with The Tide in Port Harcourt also commended the government for initiating discussions with technical partners to work out ways of recycling the tyres. Mr. Ogosu described the discussion as a good one but added that the government should fast track the discussion to enable the state reap its benefits. “It is a good step that government is talking with technical partners to recycle the tryes, but we are waiting to see what it means” he said. The former NES President said that preventing people from having access to the dump will save the state from another fire incident as the last fire on the dumpsite took more than two weeks to be put out. Meanwhile, Mr. Ogosu has said that the rate of lung ailment will increase, if the government fails to stop the proliferation of illegal refineries and burning of tryes. “The government seems not to be sincere and committal to the situation. “In future, if there is no aggressive effort, there will be increase in the incident of lung ailment because the materials are hydrocarbon based ” he said. Mr. Ogosu stressed the need for aggressive sensitization campaign to change the attitude of the people stressing that as long as people stick to their old habit, the problem of black soot and environmental degradation will continue. He particularly stressed the need for people to minimize the destruction of the forests for firewoods as well as the use of kerosene stove for cooking as it is contributing to climate change. Ogosu also stressed the need for a time frame whereby every household in the country should transit from firewood and kerosene to gas, while the government on its part should make available enough gas for cooking in the country.